In one of the major reforms of this decade, Indian Army has decided to start a new cadre of officers who will be commissioned initially as Junior commissioned officer (JCO) and will retire at looking at lieutenant colonel after serving 30 years this will address the shortage of officers at junior level and will also improve the promotional aspects of regular commissioned officers. With the rank of Brigadier being abolished, the paper says the Colonels who are approved for the next rank should become Major-Generals and command brigades (which have three battalions of 800-1000 soldiers each). The last formal review of cadre restructuring in Indian Army was done in 1984. Later, a mini-review in the form of a v Singh committee was carried out after Kargil operations in 2002-2004. This review did bring in some changes in the officer cadre, however overall structure of rank and file was kept the same. The present restructuring is therefore coming after a gap of 35 years. 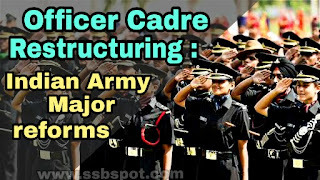 Age factor of JCO : The present system of rank structure started from sepoy and goes up to Sub Major. Its merit based and also on time scale basis by the time when reaches rank of naib Subedar, he is already above 40 years and lost most of zeal and initiative which is required in a young officer. Levels of education and intelligence: Earlier the soldiers were selected from very low educational levels and even 8th pass were recruited as soldiers. By the time when they becomes JCO's, the educational qualifications still not meet the required education to work like officer. Limited exposure to various situations in initial years of training and services: In the initial years of their life the work of a soldier is more or less very mundane administrative tasks under supervision. They didn't get enough opportunities to exercise their intellect and thus grow as such. Fear of being looked down upon among colleagues and losing face: After serving 20-25 years together,if they start behaving too sophisticated,they may be ridiculed by their co-equals. 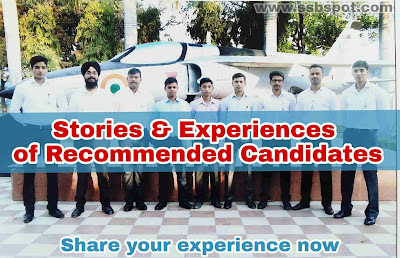 During SSB, choice will be given to candidates who have missed out on marginal basis (between 5% of passing marks for officers) to opt for JCO cadre. Age limit and other educational criteria will be similar to that of CDS exam. Suitable academy like OTA Gaya or other academy will be used of this cadre with the similar routine which is being followed in present,after 9 months of training JCO's will be commissioned into units with 6 months on the job training. Basic courses as applicable to officers will be also conducted for them. Enrollment will be in the rank of naib Subedar. Individual will be granted time scale promotion every five years till the rank of Subedar Major. After that the policy for promotion of officers will be followed. One become Lieutenant after 15 years of service. He will retire at 30 years and likely at the rank of Lt. Colonel. Directly enrolled JCO's will around 50% of young officers. This will address availability of officers,especially at junior levels. Better promotion aspects for regular officers. more competition at lower level due to more no. of young officers and thus better efficiency. Better serving of regular officers. Officers will be able to pay more attention to operational tasks leaving administrative duties with direct commissioned JCO's. Promotions only upto Lt. Colonel. this may discourage many. Existing JCO cadre may feel side lind. Friction Between officers commissioned directly and those coming via JCO rank. Dilution of intake standards is not recommended at officer level and may cause problems in operations. 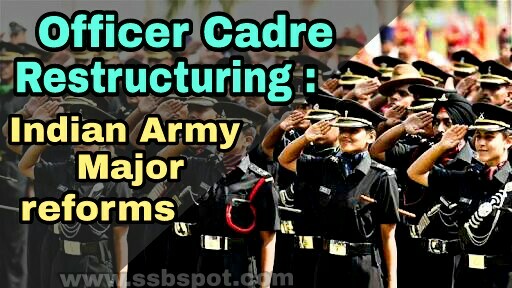 Many armies including USA follow system of direct recruitment.Restructuring is the need of the hour due to financial constraints and rising aspirations of the regular cadre. New paradigm in the warfare needs new approaches. Government need to make sure that its scheme of lateral entry works in right earnest. New system may bring cheer to many deserving candidates and bring in much needed reforms in the Army if implemented in the right earnest. It is a good system and will address lots of shortcoming of the present cadre structure. Overall a very positive step.